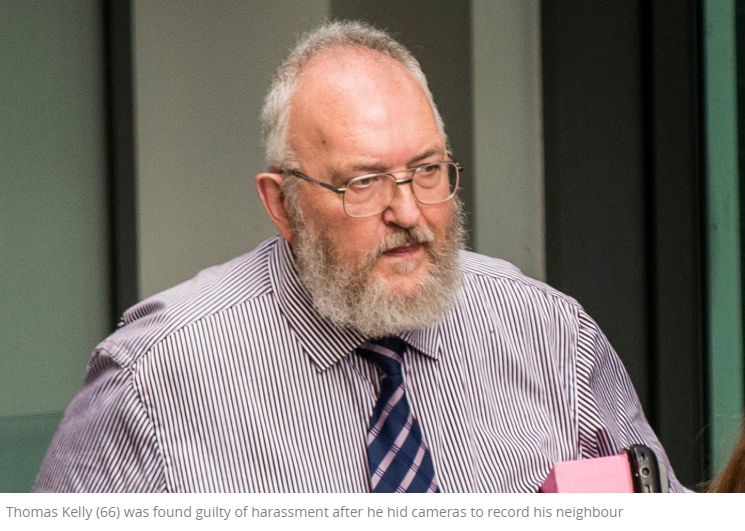 A man who used a hidden camera to secretly film his neighbours has been convicted of harassment. Thomas Kelly (66), of 14 Weirview, Lucan, Dublin, covered a camera in camouflage netting and pointed it to the rear of a neighbour’s house. Mr Kelly claimed in court he was using the camera for security, to monitor property boundaries, and to catch one of his neighbours “masturbating repeatedly” in the man’s back garden. Gardaí were alerted to the situation after the neighbour, Paul Lynam, discovered two cameras on a cliff at the back of his home in early 2016. On foot of the discovery, Mr Lynam, along with two other neighbours, journalist John Mooney and Willie Stapleton – whose homes were also captured by the camera, made an official complaint to gardaí on February 11, 2016. The following day, gardaí arrived with a search warrant for Kelly’s home along with two other properties he owned, 11 and 12 Wearview. Upon entering 14 Weirview, now-retired Detective Inspector Richard McDonald said in his evidence there were two large flat screen televisions located in the sitting room. One of the TVs was showing regular programmes, with the other having live feeds to all 16 of Kelly’s CCTV cameras. Gda Damien Reilly also discovered the camera located on top of the cliff to the rear of the house. The camera, along with the hard drive of the CCTV system and a number of USB sticks on which footage was stored, was seized by gardaí. Det Insp McDonald said video footage showed zooming in on the rear of certain homes. A further search by gardaí on July 15, 2016, discovered a replacement camera where the initial one was seized. On this occasion more USB sticks were seized. On reviewing what had been seized initially, gardaí called Mr Lynam in on May 21, 2016, to review the footage. One clip appeared to show Mr Lynam to the rear of his own home masturbating. When asked by gardaí if that was the case, Mr Lynam said it was. In his defence, Kelly claimed in court that he had witnessed Mr Lynam masturbating at the back of 7 Wearview while he was working at the top of the cliff. He said he had made a complaint to child and family agency Tusla and used the camera to catch Mr Lynam in the act. Kelly said Mr Lynam was “habitually” naked and was “masturbating repeatedly”. “My purpose in using those cameras was to capture him doing what we all knew he was doing so I could advance my case,” Kelly said. He said his grandchildren would be up on top of the cliff and he didn’t want them to witness it. Kelly also claimed that the 16 cameras were primarily used as a security mechanism and to monitor the boundaries of his land – currently the subject of an ongoing civil dispute. In their evidence, the victims said they had been “stalked”. He added that he could not allow his daughter to open the blinds at the back of the house for two years, for fears they were being watched. He said he was alerted to the cameras after Mr Lynam showed images of them to him. Defence barrister Kitty Perle described the dispute between the neighbours over land as “hotly contested and entrenched warfare”. Judge David McHugh found the defendant guilty on four counts of harassment. Kelly was remanded on bail until September 27, when victim impact statements will be read out.